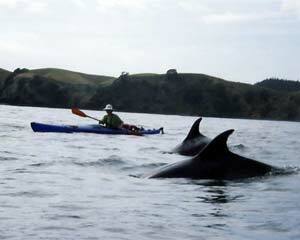 Northland Sea Kayaking destinations are chosen in accordance with experience, weather and sea conditions. Tours will journey to different areas each day for those interested in multi-day trips. Tour activities are flexible and can be modified or combined to suit specific interests, such as snorkeling, fishing, surfing and general kayaking skill building. Double kayaks are provided and highly encouraged wherever possible. A fleet of singles are also available. Participation of children is subject to overall assessment of conditions and individual capability. Children 12 and under are eligible for a discount on tours. Day long tours depart from tour headquarters on Tauranga Bay Road, with orientation commencing at 9am prior to launching. Tours return to the shore around 4:30 pm. Half day tours begin at 9am and return about 1pm, or begin at 12:30 and complete about 4:30 pm. To book a Northland Sea Kayaking tour, simply call us at 09 405-0381 or use our online contact form. We are easiest to reach live between the hours after 6pm or in the morning before 9am and are often able to return messages within a few hours if not sooner, so please do leave a message and return number, or try back if you don't get through initially. Due to the private location, bookings are essential. Bookings can also be made through email. NZ$ - Cash or check only please. Northland Sea Kayaking reserves the right to launch or land trips in alternate locations within the area, if conditions are unfavorable for the exposed coastline. We will trailer boats to or from sites as needed and coordinate with clients accordingly. Northland Sea Kayaking reserves the right to cancel a tour due to weather or other extenuating circumstances.